The Merger and Acquisition game is an unusual one. Part art, part science, and part psychological warfare. There are a lot of functions involved in the process be it financial, analytical, legal, or communication. Most sellers are not very sophisticated and are not aware of the various ways they can lose value throughout a deal. A good Merger and Acquisition Financing Advisor can help you negotiate a better price and also set up the financing for the closing. They provide a one-stop shop level of value to your process. A Merger and Acquisition Financing Advisor brings the back end of the acquisition process into the front end of structuring the deal. They will anticipate lender issues with respect to credit underwriting or quality of financial reporting. This saves you time and money throughout your process. 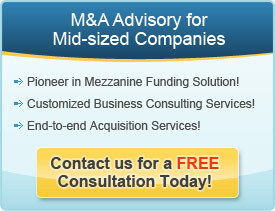 High quality Merger and Acquisition Financing Advisors can quickly size up a deal and assess how bankable it is. They can layer out the deal structure and advise you on creative ways to close the value gap with the seller. The best Merger and Acquisition Financing Advisor understand the pressure points of the deal. If required, they know how to recut the deal mid-stream without blowing the deal up. In the acquisitions arena, it is said that the best Merger and Acquisition Financing Advisors are worth their weight in gold. Their fees are miniscule compared to the value they bring their clients. These advisors will pay for themselves many times over because of the quality of their sage-like counsel.